← Food for thought: Is it wise to spend so much money on defense? Now on a new team with a chance to break into a more important offensive role, Emerson Etem is ready to make the most of this opportunity. Photo courtesy of Jeff Gross/Getty Images. With salary cap constraints and guys like Derek Stepan looking for long-term contracts (potentially very expensive), the Rangers were almost forced to trade away Carl Hagelin, a dependable, strong possession winger that has anchored the Rangers third line since 2011. However, Jeff Gorton was still able to bring in a young player with a lot of potential. 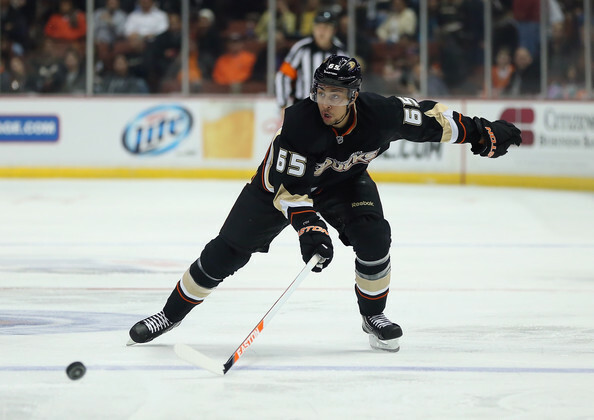 Emerson Etem, born in Long Beach, California, was selected in the first round of the 2010 NHL draft by the Anaheim Ducks, keeping him in the state that he grew up in, and allowing family and friends to watch him begin his professional hockey career. 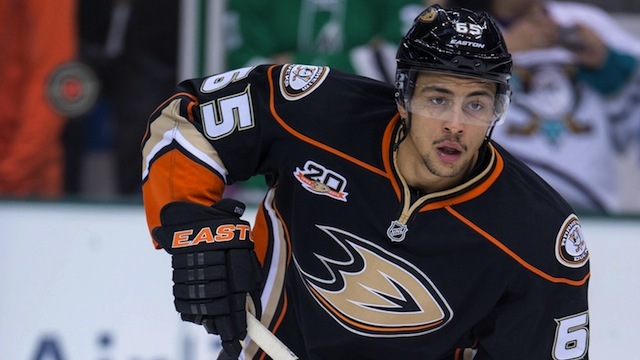 While that makes for a great story, things did not work out as Etem hoped, bouncing between the NHL and AHL affiliate Norfolk over the past three seasons, never playing more than 45 games with the Ducks in a single year. Despite having an immense amount of talent and skill, and a past history of scoring (61-46-107 in his final year of Junior Hockey), the Ducks never game him a real chance at cracking the top-nine, let alone a role as a top-six forward. He was buried on the fourth line with less-skilled teammates, which would explain why he had just 10 points (5-5-10) in 45 games this season, and 31 points (15-16-31) in 112 career games. Now across the country, with a new team and a new opportunity, Etem now has the chance to immediately jump into a top-nine forward role according to Rangers GM Jeff Gorton. When watching or reading any interviews with Etem after he came to the Rangers, he has a great attitude about being in a new environment, and seems genuinely happy and excited to be in New York. He also realizes that he will now have a chance to take on a bigger role, and use his skills to show what kind of player he can really be. One of the things that Hagelin was able to do well is use his speed to force opponents to back off, creating more space on the ice for his teammates. You might find yourself saying the same thing about Etem throughout the season. While he doesn’t have the same speed as Hagelin (not many people do), Etem is a very powerful skater that can blow by a lot of the defensemen in the league. Like Kreider, he is a very powerful skater with strong strides. Once he builds up momentum and speed, it’ll be really hard to stop him. On top of his skating ability, Etem also possess size and strength. At 6’1” and 206 pounds, he’s more than capable of battling along the boards, shielding defenders from the puck and battling in front of the net. He’s not afraid to throw the body, and the combination of physicality and skill makes him unique. Etem has a unique blend of size and skill that makes him threatening to opposing players. Photo courtesy of Jerome Miron/USA TODAY Sports. Etem will not be buried on the fourth line, and I really doubt that he will be in Hartford at all, which has to be reassuring for him. With Hagelin and St. Louis now gone, the Rangers need their younger players like JT Miller, Jesper Fast and Emerson Etem to step up and help fill the void. Etem has a tremendous work ethic, and seems ready to capitalize on his chance to finally break into a more offensive role. He definitely has the skill to be a solid contributor on the third line, and grow under the guidance of Alain Vigneault. AV has helped guys like Miller and Fast really develop and improve this season, and I think he should be able to do the same with Etem. Don’t be surprised if Etem becomes a regular contributor in the Rangers top-nine next season. He has the talent, the determination, and the opportunity to cement himself in the Rangers’ roster. Quotes courtesy of CBS New York and Blueshirts United. Posted on July 8, 2015, in In the Crease and tagged Alain Vigneault, Carl Hagelin, Emerson Etem, Etem Rangers, Etem trade, Hagelin trade, Madison Square Garden, Martin St. Louis, MSG, New York Rangers, New York Rangers blog, NYR, Rangers, Rangers blog. Bookmark the permalink. 3 Comments. Really positive words. I thoroughly enjoyed this and am just as optimistic about Etem. He seems genuinely pumped. It may not happen right away, but within the next two years we’re going to see the best Etem can offer, IMO. I’m confident that his best won’t disappoint.